You are here: Home / Deals / Blue Apron Review + How to Get a FREE Blue Apron Box! 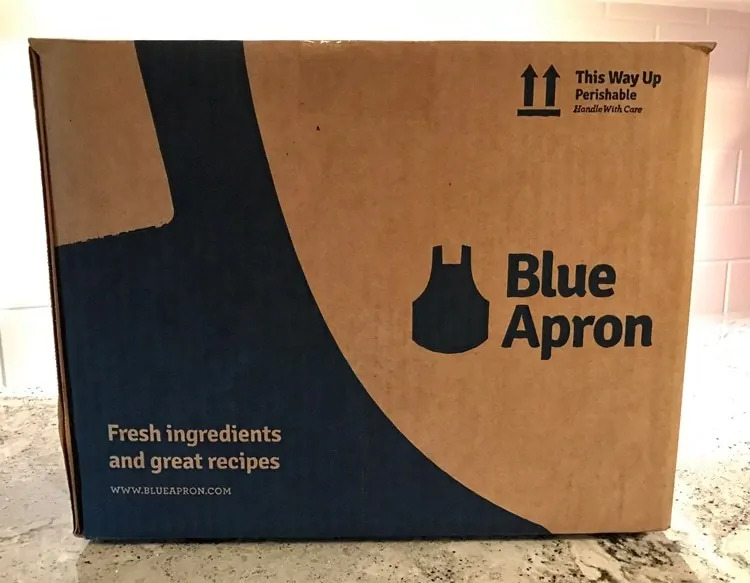 Blue Apron Review + How to Get a FREE Blue Apron Box! I received a complimentary Blue Apron box in return for sharing my experience with my readers. All opinions are 100% my own. You can review my complete Disclosure Policy here. Thinking about trying Blue Apron?! If so you will absolutely want to read my husband and I's Blue Apron Review. We got a Blue Apron Box with ingredients for 3 meals and documented our experience so that we could share it with you guys. 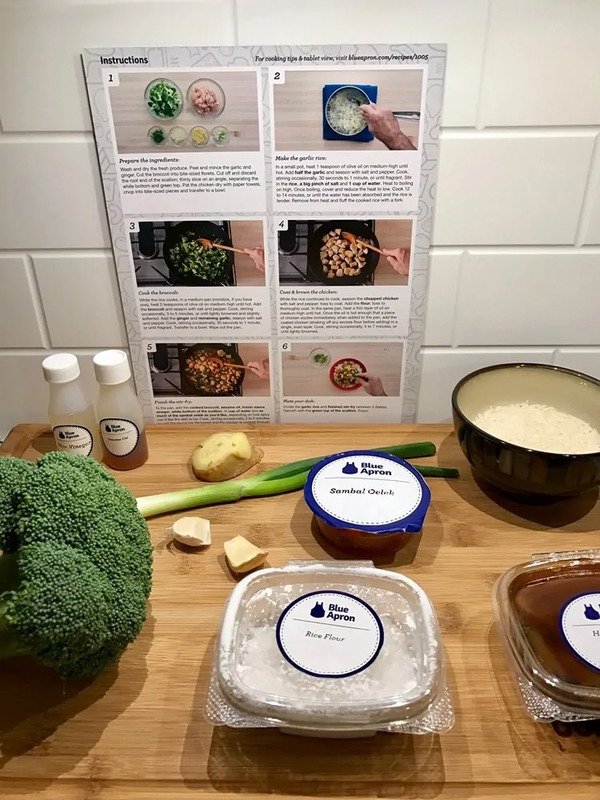 So, read on to find out if Blue Apron sounds like it is a good fit for you. Plus, find out how you can sign-up for Blue Apron's limited-time 3 free meal offer! 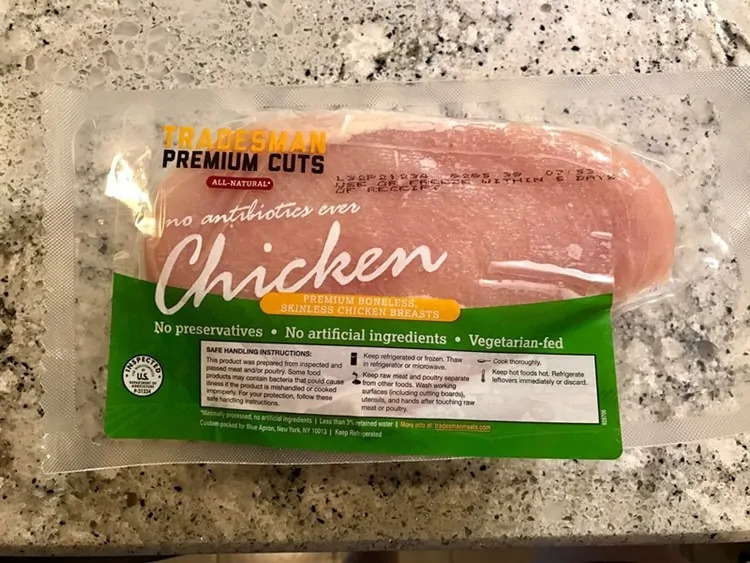 When my first Blue Apron box arrived I eagerly opened it up to take a look at the quality and condition of the ingredients. The produce all looked amazing and the chicken and beef were still ice cold. I must confess that I had my concerns about meat going through the mail. But, Blue Apron came through with their awesome packaging. Large ice packs sandwiched the meat, keeping them nice and cold. To be honest, as hubby and I reviewed the meals that we would be preparing we were unsure if we would enjoy them. We are so used to our limited menu of hamburgers, pasta, meatloaf, chick tenders, and pizza. Basically, we both have the palate of a 5 year old. Cabbage and capers on pizza? But no sauce? What is this madness?! Butternut squash? Is that a nut or a squash? And what in the world are Hoisen, Sambal Oelek, and Ras el Hanout? Then, I took a look at the recipes. Blue Apron doesn't skimp out when it comes to recipe cards. These recipe cards are on full 8.5″ by 11″ thick cardstock and feature large, colorful, images. They break down these somewhat complex (at least for us) meals into easy to follow steps. Okay, we got this! 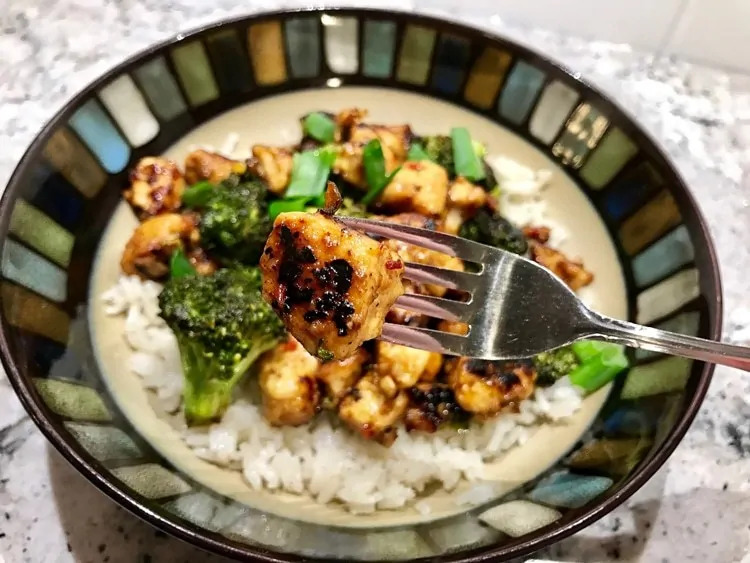 The first evening we set out to make Spicy Hoisin Chicken & Broccoli with Garlic Rice. Following the step-by-step directions on the recipe card we prepared our ingredients and cooked the rice, broccoli, and chicken. Then, we threw the broccoli and chicken together in a stir-fry and served it on top of the rice. 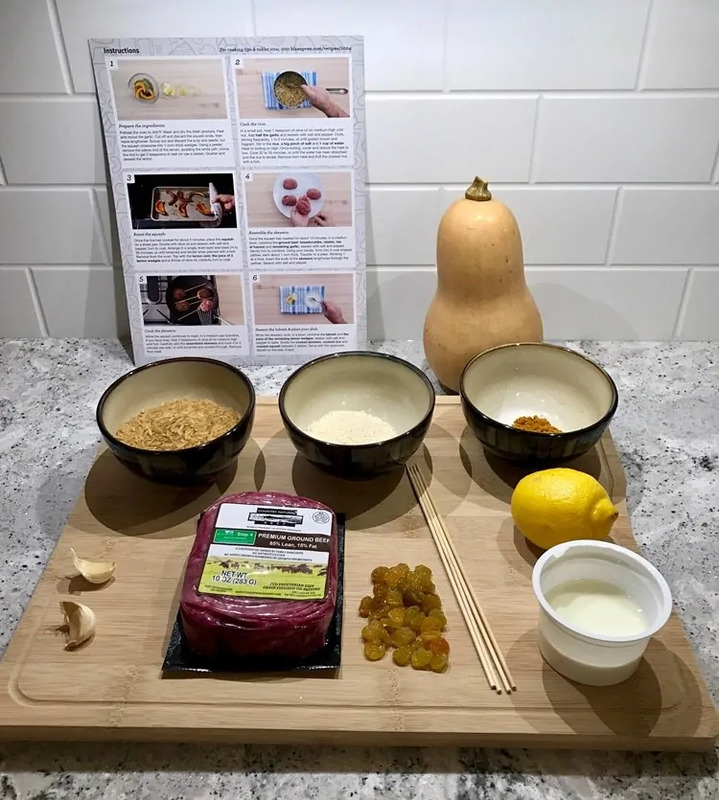 Thanks to the step-by-step instructions on the recipe card, we were able to prepare the meal with ease. And you know what?! It was amazing. We both couldn't stop raving about how delicious it was, and how amazing it is that we made it ourselves. Come the next evening, we decided to prepare the Spiced Beef Skewers with Roasted Squash & Garlic Rice. I mean, at this point we were total rice pros after our success with rice the previous evening. Again we rocked the meal, it came out wonderfully, and we loved it. While spiced beef skewers and butternut squash are 2 things we would have never thought to make ourselves, we couldn't get enough. And that Labneh Cheese seasoned with a bit of lemon and some salt and pepper?! It was an incredible compliment to the spicy beef. Another rockin' meal. 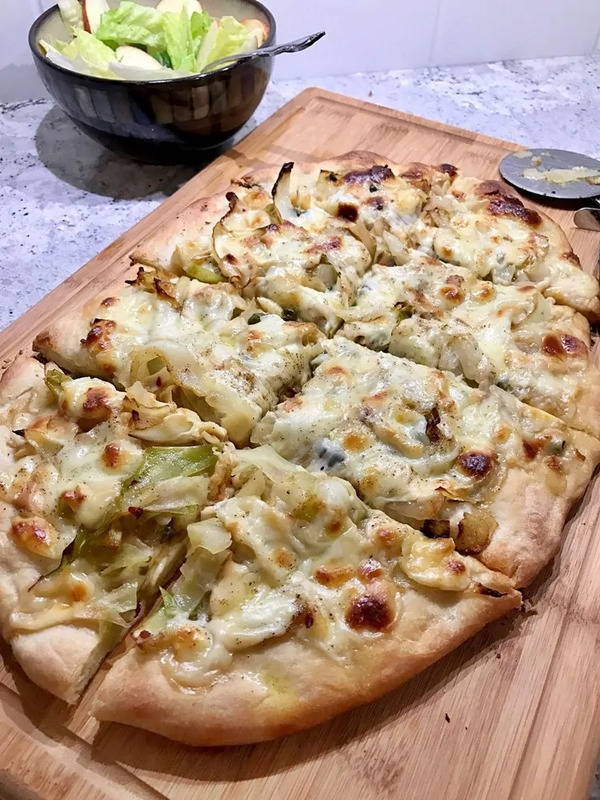 The 3rd night we made the Smoked Mozzarella and Cabbage Pizza with Romaine and Apple Salad. 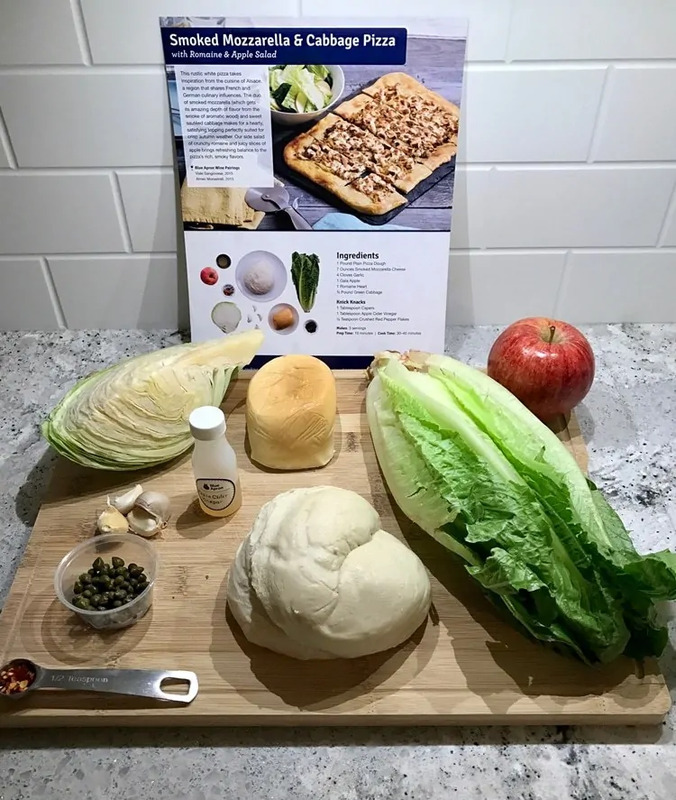 This meal was actually the most difficult for us to prepare, as I could not get the pizza dough to cover the entire baking sheet like the photo in the recipe card (you can see the photo I am referring to in the image above). I rolled and stretched the dough out but it kept shrinking back down. In the end, I just went with our slightly smaller and not at rectangular dough shape and it came out perfect anyway. The taste of the cabbage, mozz, and capers all mixed together was amazing. Who knew?! 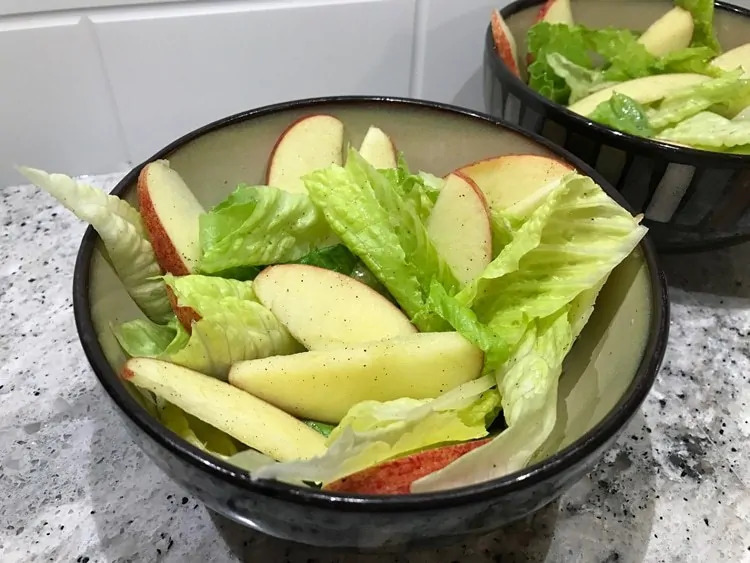 Our apple salads were delicious as well, and so super simple to make. My husband and I were both chatting about which meal out of the 3 was our favorite. Guess what?! We both couldn't even choose one. We liked them all that much. And the best part?! Now that we have the recipes we can always pick up the ingredients at the store and prepare them again at anytime. My husband and I enjoyed everything from the quality time spent cooking together to the tasty meals that we prepared. I really love how Blue Apron makes cooking a delicious meal fun and easy. They deliver easy-to-follow recipes and all the fresh ingredients you will need right to your doorstep, already in the right proportions. They make people at home, like you and I, into amazing chefs. I cannot wait for our next Blue Apron box, and the chance to prepare and try additional new meals. But I'll tell ya… the next box has a whole lot to live up to because I would rate this first box a 10 out of 10. If you would like to give Blue Apron a try as well, you are in luck! Blue Apron was kind enough to give me a super special deal to share with my readers. 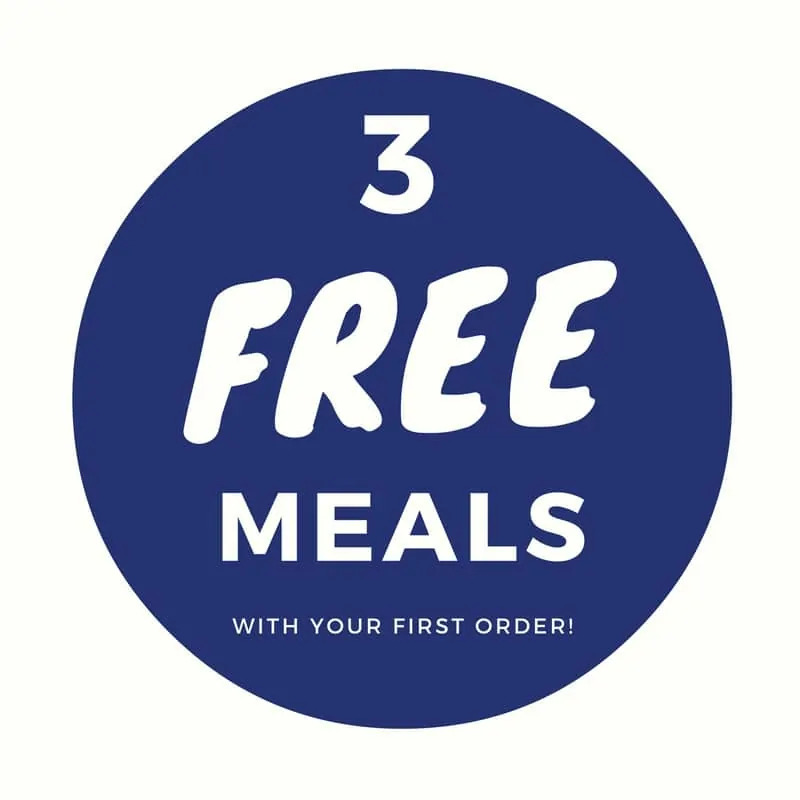 If you sign up right now you can get 3 FREE meals with your first order. Yes, that is right. A box with 3 meals for 3 nights of dinners (just like I reviewed) absolutely FREE with your first order! 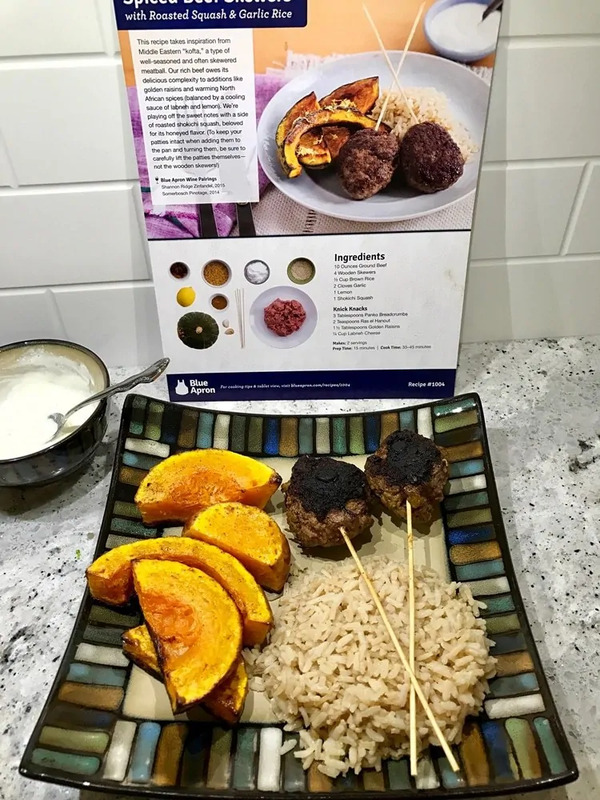 Once you try Blue Apron for yourself be sure to come back and share with us what meals you made! That pizza looks so good my stomach is growling. hahaha Friday is pizza night too! Woo Hoo did I stop at the right place or what. Going to have to try this box thing. Thanks for sharing. One of my neighbors gets a box from Blue Apron, and I haven’t seen her to ask her about it. But wow, this is amazing, everything does look good! I would have been skittish about meat through the mail, too, but hearing your experience makes me think it is OK!!! I’d love to try it! Great job on those meals! They all looked very appetizing. I might be enticed to try it if I had the disposable income for it. Omgosh!! They all look so amazing!! Im so glad that even though you were wary about ingredients that you made them anyways!! My hubby would boycott it until he tried it lol!! have to offer in there meals. Your comments about the unusual ingredients had me laughing. I guess that’s why Blue Apron would be a great way to try dishes using exotic spices. You wouldn’t have to go searching for them in stores and, if you didn’t like it, you wouldn’t be stuck with a jar of spices you wouldn’t use again.